Part Three: Cajun Gumbo, or Dumbo? Karen: I've always thought that the 1990s were a terrible time for comics. We had all the ridiculous gimmicks, like the foil covers, multiple covers, and holographic covers. But the quality of comics in general seemed to decline. I was particularly put off by the 'art'. Sure, there were some guys who eventually blossomed, like Jim Lee, and then there were those who just kept sliding further and further down the slippery slope of horrifically bad (and yes, I do mean Liefeld). Doug: What are you trying to say, Karen? That you aren't built like one of their women who would have permanent spinal cord damage from posturing all the time? Karen: To go along with this, there were a lot of horrible costume designs. The X-Men were at the forefront of this. Suddenly, the X-Men were all covered with straps and pouches. People had padding all over. Headbands. It was awful. 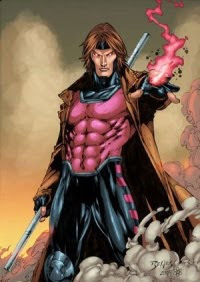 And the one that bothered me the most was Gambit. 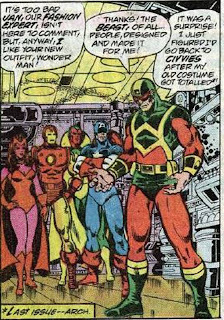 Doug: Yeah, all of those accessories almost made those stupid bomber jackets the Avengers were wearing look good! Karen: Let's take a look at his ensemble. It is confused. It looks like three different character designs were combined into one. We have the skin-tight jumpsuit, with the odd steel blue and violet color combo. He has weird scriggly things around his neck. Headband, che ck. The boots look either metallic, or later, like robot-dinosaur feet. And of course, the most glaring item, the trenchcoat. I have no problem with trenchcoats per se. But combined with tights, well, I think they look ridiculous. Karen: I don't get this. What are they going for here? The trenchcoat seems to indicate toughness, yet he's got that big violet chest piece, which just seems kinda wimpy. Karen: But I should admit that I am biased, as I always thought Gambit had the dumbest powers to go along with his look. I mean, c'mon - the guy throws playing cards at people. I guess if he missed his target, they'd probably fall on the floor laughing, so he'd still catch them. But really...playing cards. Doug: The only time playing cards were used in an "oh, wow" way was by Bullseye in Daredevil #181, and that was certainly a morbid display of accuracy. Karen: Obviously, I am calling this one a disaster. Doug: Second. And get a haircut, too! Some of you newbies around here may not be aware, but Karen and Doug, along with their comrade Sharon, own another blog that deals primarily with the Silver Age. It's called Two Girls, A Guy, and Some Comics. Over time, however, there've been lots and lots of Bronze Age goodness discussed at that cyber-setting. Below you'll find some images that relate to the stories we did over there, before Karen and Doug found out just how much fun it would be to have a blog dedicated just to the Swingin' '70's and the Me '80's. Check it out, and as always, leave a comment! The Celestial Madonna, covering Avengers #'s 129-135 and Giant-Size Avengers #'s 2-4. Marvel Team-Up prototypes, covering Amazing Spider-Man #'s 62, 71, 86, and 92. Captain America -- Secret Empire, covering Captain America #'s 169-176. West Coast Avengers -- Vision Quest -- covering WCA #'s 42-45, and 47. Doug: OK, Faithful Ones, after a few in-betweener posts on the Code and what was going on back in those frightful days of 1968-1971, it’s back to the comics! We kick off our last three posts (whew! Looks like it will be a total of 10 on this topic!) with an examination of Stan Lee’s decision to publish the so-called “drug issues” outside the parameters of the Comics Code Authority, before it was subsequently revised. 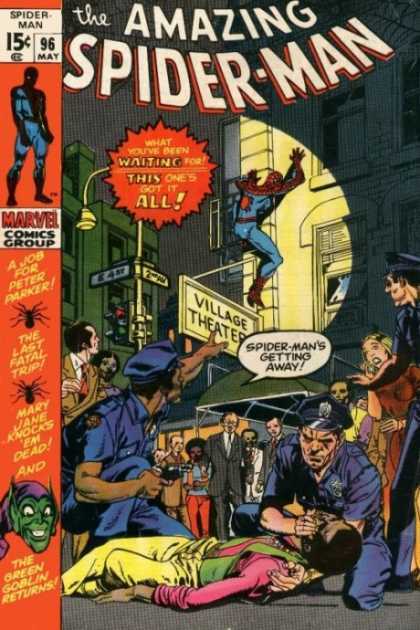 Doug: As we go through this, keep in mind that the last post in this series covered The Spectacular Spider-Man #2, published in November 1968 – 2 ½ years before ASM #96 hit the stands. And while we discussed how “psychedelic drugs” were used in the story, there was no conflict with the Code, as that comic was actually a magazine. Doug: It’s funny – I got to page 9 of ASM #96, there’d been virtually no web-swinging, and I’d been loving this comic! What characterization! Stan Lee, despite his faults that are brought up in the numerous histories/biographies about him, was a fantastic writer. And let’s compliment the art team of Kane and Romita as well – the pacing of the story was perfect. We’ve discussed Gil Kane under the influence of different inkers in the past – suffice it to say that Jazzy Johnny gets my vote for Number One! Even Kane’s notorious nose up-shots are cured by Romita’s inks. It’s really a nice pairing of talents. Karen: I agree with you about enjoying the story despite the absence of super-heroics early on. I think Spidey’s personal life was always a huge draw for readers. Peter had all the problems the rest of us did, likely more. He was a great Everyman with whom most people could readily sympathize. Karen: I also enjoyed the art on this issue. My first issue of Spider-Man was #98, which we’ll be getting to shortly. But I was also reading Marvel Tales concurrently, and ever since those days, in my head when I see Spidey it’s always Romita’s version. With him providing the inks on Kane’s work, it was not jarring to go from the reprint to the regular title! 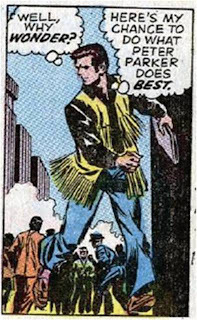 But what was with that fringed vest Kane drew on Peter? Man, that looks so dated now! Doug: Speaking of the aforementioned Spectacular Spider-Man, there is no mention of that story in ASM #96. 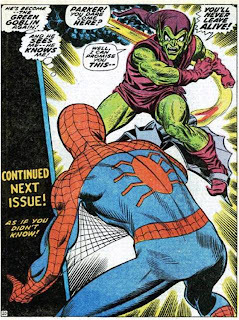 The only references made to Norman Osborn’s having been the Green Goblin and having at one time known Spider-Man’s secret identity are from a page of flashbacks to ASM #40. Doug: The first half of the book is about Peter Parker and his various dilemmas: no money, Gwen’s in London but he couldn’t see her because why would Peter and Spidey both be in London, Robbie Robertson may be on to Pete’s secret, Aunt May is trying to be “hep”, etc. It’s pretty standard angst from Stan’s typewriter, but you know what? I love it! I don’t read Spider-Man comics anymore, but I don’t much care for the goings-on I’ve heard about. THIS is my Spider-Man! Doug: As the story progresses, Harry sets up an interview for Peter with Harry’s dad Norman. When Pete walks in, he overhears the end of Norman’s physical with a doctor. The doctor stresses to Norman over and over to not exert himself, to not get excited, and to not think about super-heroes or Spider-Man. Of course, you know how this is going to go! Doug: But, the interview goes well, Pete garners a part-time job, and Norman offers to pay Pete’s way to the theatre later that evening where the gang will be watching Mary Jane’s off-Broadway debut. But before heading over, Pete decides to change into his Spidey suit and follow a couple of squad cars that are heading to a call. Doug: Spidey comes upon a “stoned” young man wavering atop a highrise roof. The guy keeps mumbling how he can fly, he’s a lion, he’s an eagle, and then he loses what little balance he has and plummets toward the ground. Fortunately Spidey swoops down on a webline and saves the guy. Karen: Even though Stan himself has admitted he did no research for this story (or any other, from what he says), the incident with the freaked out kid on the roof plays very seriously, even when Peter makes a little speech afterwards about the evils of drugs. I don’t know what sort of drug Stan thought would cause that kid to go up on a roof like that, but the fall could really be seen as a metaphor for the damage drugs can do to one’s life. Karen: More social commentary from Stan, which might seem hokey now, but I’m sure it was surprising back then. I have always been impressed with the way Stan and the Bullpen made sure to work black characters into stories. 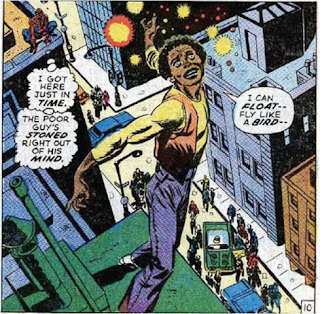 When you open a Marvel comic from this era, you’ll see not only black supporting characters like Randy and Joe Robertson, but backgrounds with black cab drivers, policemen, firemen, etc. There was a real effort on Marvel’s part to show society in all its facets. With Randy, we see his frustration, but he doesn’t come across as a one-dimensional “angry young black man”. 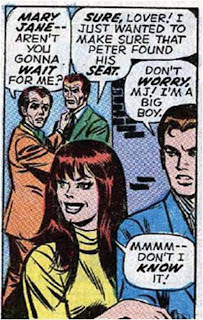 Karen: This issue is also a harsh reminder of what Mary Jane was like in the early days: a flirt, even manipulative. She deliberately gloms on to Peter, apparently just to upset Harry. This was not the girl Peter was supposed to marry, at least not originally! Doug: While in the theatre, the group meets backstage during intermission to congratulate MJ on what has thus far been a great show. But, Pete notices that Norman is sweating and uncomfortable. Pete also notices that Norman is standing close to an unmarked door, and then his Spider-sense begins to tingle. Could this be one of the Goblin’s secret hide-outs? Doug: After the show is over and everyone’s saluted MJ’s efforts, Norman and Peter find excuses to head their separate ways. You can see where this is headed, and it ain’t good! Greetings again, Keepers of the Flame! Today's partial tour of Doug's hidden treasure trove features a look at the library displays as well as some cool posters! My custom shelving system, of which I've shown glimpses over the past five parts of our tour, is 12 cubicles and one top shelf that runs the width of the system. It was designed so that I could compartmentalize my collection of action figures and reprint/reference books. It's been a great asset to be able to do this, but as I continue to buy those wonderful tomes that catch my eye -- you know, "someday I'll curl up and read this!" -- the space is becoming more and more limited. It won't be too long before I have to rethink the displays. First up today is the Batman shelf. I didn't pull back completely, as I wanted you to hopefully be able to see some of the titles on the book spines. You'll find Les Daniels' fine Batman: The Complete History, the 3-volume Batman Illustrated by Neal Adams, John Byrne's Batman 3-D, Mark Cotta Vaz's Tales of the Dark Knight: Batman's First Fifty Years, Frank Miller's The Dark Knight Returns in softcover and hardcover, and more. In front of the library are the Alex Ross-sculpted Justice action figures of Batman and Batgirl. Oh, how I wish I'd have bought his Joker figure at the time! You might also notice the buttons I referred to in Part 1 of this series. To the left you can see various Bat-collectibles, most of them tied into either the movie franchise of Batman: The Animated Series. These are just a small representation of the collection I've amassed over the years -- much of it given to me as gifts. You can see soap dispensers, Band-Aids, and a rotary sucker holder! Directly to the left of the Batman shelf are two displays of DC's youthful heroes -- the Teen Titans and the Legion of Super-Heroes. Since the Legion display is a little larger (and since I like that book more than the Titans -- although I do like the Titans quite a bit), I chose to focus on that half. It's much simpler than the Batman shelf, with only six action figures (all DC Direct) and a complete 12-volume set of The Legion Archives -- when, oh when, will they get around to making volume 13?!? The Superboy and Supergirl are from the box set that came with Krypto and Streaky -- they are in accessory-limbo in the closet. Mordru was an early DC Direct-offering, and the three founders were issued in the same series. I just wish Saturn Girl could stand on her own! That has always been a complaint of mine about DC Direct and their female action figures. You might wonder why I don't have any of the other Legion boys who were issued off and on over several years. Simple -- they just didn't appeal to me. Not the characters -- no way! But the sculpts were so cookie-cutter, so generic. I really like, despite limited articulation, the founders. But what came after was just so bland. The other two books in the photo are TwoMorrows' The Legion Companion by Glen Cadigan, and Legion of Super-Heroes: 1050 Years of the Future tpb. Around the room you'll find some of the original comic art I showed off in Part 4, as well as several framed posters. I'll show three here -- two promotional pieces that I was lucky enough to have autographed by Alex Ross at various comic conventions/shows in the Chicagoland area, and one of the black light posters that was published by the Third Eye company back in the 1970's. If memory serves, I won this by pitching pennies or some such thing at a carnival in my hometown. I also have the Jack Kirby-illustrated Medusa poster, but it's in storage for the time being. The Overstreet Fan #14 poster was just a giveaway at Wizardworld Chicago one year and I picked it up. While in line to greet Alex Ross he offered to sign it for me; I felt guilty, as I'd already asked him to sign two books. But that's Alex Ross -- if you've ever met him, then you know he is one of the most down-to-earth and gracious people you'd ever want to meet. Just a true gentleman. I believe I've had the privilege at least four times to have greeted and chatted with him. The Marvels #2 promo poster was also a giveaway, but at a smaller show near O'Hare airport. As you might guess, it was out at the same time Marvels #1 was hitting the shelves. This would have been back in the early 1990's -- for Alex Ross, the long hair and full beard days! He's a much better-looking fellow these days, all clean-cut. For both of these posters I've included larger images of the autographs. That wraps it up for this time 'round. Before I cut out, I thought I'd invite you back for the next installment, when we'll look at some premiums from Kraft foods, as well as some beanies from the Warner Bros. Studio Stores. The Defenders: Non-team, or Avengers Lite? Karen: Most comic fans love super-hero teams. There’s something exciting about seeing a whole bunch of characters in one book. It’s easier to explain why the heroes are all together when they share a common background, such as the Fantastic Four or the X-Men. But more haphazard collections of heroes can also work, with team chemistry being manufactured, as in the case of many different line-ups of the Avengers, heroes who have no common ties other than the desire to fight evil. Doug: Count me among those who have generally been a “group first” buyer. As a kid, I bought all of the titles Karen mentioned, as well as the Champions, the Teen Titans, the Secret Society of Super-Villains, and probably some others I’m forgetting. I always liked the interpersonal dynamics available in group books. While the solo heroes (Spidey, DD) could grow in characterization over the course of a series, there generally wasn’t the possibility for interplay between the hero and the cast – when he was the hero. Interplay was not a problem in a team book. 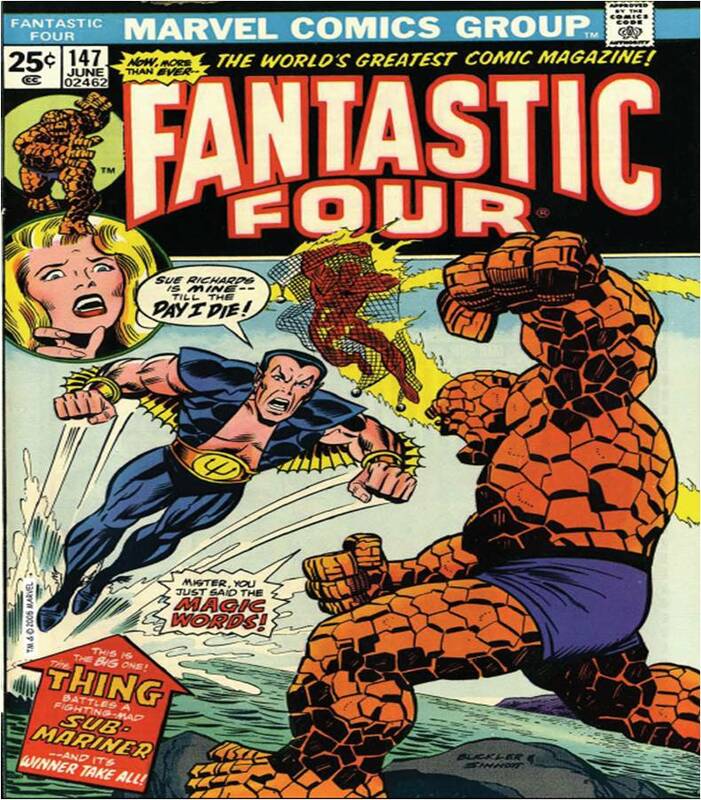 Karen: By the early 70s, Marvel had two very successful super-teams, the Fantastic Four and the Avengers. The X-Men had fallen into a period of near-dormancy, and other groups, like the Inhumans, never really caught on in their own books. With the increase in the number of titles Marvel was able to put out, it made sense to try to build another winning team. Doug: Inhumans. Thank you. I knew I forgot to mention another book above. As for them specifically, I just don’t know how committed Marvel was to making them a success in their own book. Same thing for the Guardians of the Galaxy. Karen: The catalyst for this would be Roy Thomas, the writer/editor who ushered in so many new concepts in Marvel’s second wave of success. Thomas had put together the uneasy team of the Sub-Mariner, Hulk, and Silver Surfer in Sub-Mariner # 34-35 (Feb-Mar 1971), and the sales on those issues were better than usual. Marvel head honcho Stan Lee decided it was a good sign, and declared the team should have their own book, even coming up with the name, “The Defenders”. However, he wouldn’t let Thomas use the Silver Surfer! The Surfer was his pet character and he didn’t want anyone but himself writing him. Instead, the third member of the team would be Doctor Strange. In retrospect, Thomas felt that this change worked out well, as Strange provided the glue that held the other two together. Recognizing the anti-hero nature of both Hulk and Sub-Mariner, and the unlikelihood of them forming any real team, Thomas defined the Defenders as “the non-team” – essentially, a group of guys who keep getting thrown together to face a common threat. Unlike the Avengers, the Defenders had no interest in staying together, but fate (and comic sales) kept them coming back. Karen: Let’s take a look at Marvel Feature 1. The first thing one notices is the incredibly sketchy artwork! I always thought this was a terrible art job, and didn’t know why until recently, when I read the Marvel Masterworks Defenders Volume 1. In the foreword, Thomas explains that artist Ross Andru often drew multiple lines in his work, as if he couldn‘t decide where to stop. Inker Everett was apparently annoyed by this, and decided to just ink everything, giving the book a very rough appearance. It’s particularly painful with the facial expressions of the figures. Doug: I read this for the first time for this discussion. I used the Essential Defenders, Volume 1 which is of course in black and white. While I am certain Marvel never intended to publish this story in one of their magazines, one almost has to wonder. As Karen says, it is such a departure from the usual linework. I’d also add that, if held to a visual pop quiz as to who the artist was for this story, I never would have come up with Ross Andru. While I’m a fan of his Amazing Spider-Man work from this same era, here none of the distinctive figures or faces are present. Bill Everett must have exerted quite a bit of influence on Andru’s pencils – perhaps Andru provided only lay-outs? Karen: It seems from what Roy says, that it was typical for Andru to keep noodling around with his drawings, leaving multiple lines, and the inker had to pick which lines to ink! Apparently, Everett decided, “Screw it, I’ll ink ‘em all” as some sort of statement. But that didn’t go over very well when the inked work was returned! Doug: No, it didn’t look good at all. You and I have complained on other forums that the modern-day John Byrne is scratchy – nothing like this mass of lines however. Karen: I found the story to be rather pedestrian – the trio has to stop a foe of Strange named Yandroth who has built a device (‘the Omegatron’!) that will destroy the world. What kept me reading were the interactions between the three non-team-mates. 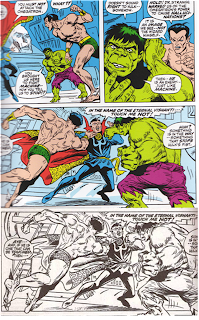 Namor and Hulk both bridle at being given orders by Strange, who has a job more difficult than herding cats. At the end, they all agree that they never want to get together again – which of course they do in the next issue. Doug: Call me a heretic, but sometimes Roy Thomas just isn’t the guy for the job. I don’t care for him on Spider-Man, and his Fantastic Four was only OK. I just thought he really had a tough time finding the different voices. I’m not a Dr. Strange fan by any stretch (never have been), but I found the dichotomy between having to save the world and intentionally and deceitfully pitting Namor and the Hulk against one another an interesting moral dilemma. Karen: Doc’s treatment of the Hulk in particular was pretty arrogant. I do think I prefer the way Steve Englehart handled their relationship. Karen: Marvel Feature #2 has a much more polished look, with Sal Buscema’s inking. The trio re-unites to defeat Dormammu and his minions. This issue also features Tom Fagan and the Rutland, Vermont Halloween parade, seen in a number of other Marvel books of that era, as well as a cameo by Roy Thomas himself. It’s funny, back in those days I got a kick out of comic creators putting themselves in books, but if anyone did it today I’d probably think they were an egotistical jerk! Oh well, different times. Doug: I think that’s because some of them are egotistical jerks; why else would they think they have such free reign to cook in Stan’s and Jack’s kitchen the way they do? But I digress. I liked the Rutland Halloween stories that were in Avengers #119 and in Batman. Fun stuff – added some “real world” feel to the stories. Doug: By this time, having read the pre-Defenders stories that had taken place in Doctor Strange, Incredible Hulk, and Sub-Mariner, I was getting a little perturbed that Dr. Strange’s baddies always seemed to be the villain du jour. How come he could give ‘em a beatdown by himself in his own book, but in Marvel Feature he needed help? Karen: I found this issue much more enjoyable than the previous one. A large part of the reason for that must be the artwork. But I also thought this story was better constructed. Doug: Agreed. Of the three issues we’re discussing, this was the “funnest”. Karen: The team’s third go-round, in Marvel Feature #3, once again features Everett on inks, and again, I feel the art suffers. It’s not horrendous like the first issue was, but it lacks the smoothness that Buscema brought to Andru’s pencils. Doug: I thought the Hulk looked dorky in all three issues. It seemed like his arms were too long, like he was drawn almost ape-like. Karen: The Hulk definitely had a more monsterish appearance. 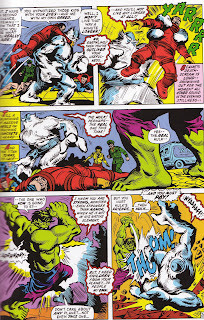 Although Herb Trimpe was the artist on Incredible Hulk when I was a kid, I always liked Sal Buscema’s Hulk better. His Hulk seemed more capable of conveying a variety of emotions, yet he still felt big and powerful. Doug: Yeah, I saw Trimpe’s stuff – I was never a regular reader of the Hulk. I agree with you in that when I think of the Hulk in the 1970’s, I see Sal’s work, or perhaps John Romita’s promo stuff. Karen: This time the Defenders face Xemnu, a big furry weirdo who wants to kidnap Earth’s children and take them back to repopulate his own world. Xemnu had first appeared in Journey into Mystery #62, where he was known as The Hulk! Obviously, Thomas was having a little fun, digging this old monster out of the mothballs. It’s a quirky tale but pretty interesting. Doug: Interesting that Stan cites Monsters on the Prowl #’s 11 and 14 for his footnote on Xemnu’s previous appearances. Marvel always was good at keeping older characters on the shelves in the pages of their various reprint mags. As for the story itself, I actually found it sort of annoying – I didn’t care for the astronauts or for Xemnu, and I just didn’t think Xemnu’s angle was ever really explained nor particularly rational (yeah, yeah, I know it’s a comic book…). 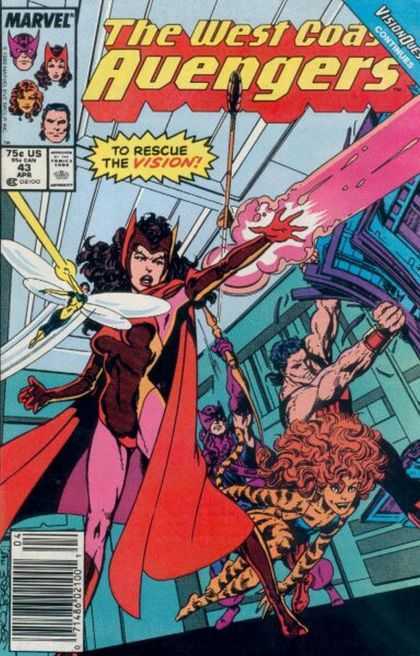 Karen: The Defenders would go on to their own title, and Thomas would hand the reins over to Steve Englehart. Sal Buscema would be the regular penciller, and the two of them would have quite a run on the book. Doug: Both creators were at the height of their powers in this era. Good stuff couldn’t help but happen when they teamed up! Karen: The Defenders was always a group that left me wanting more. There just seemed to be something missing. Considering the great characters that went in and out of the team – Dr. Strange, Hulk, Namor, the Surfer – there was the opportunity to leave a legacy of some classic stories. And yet, when I think about the Defenders as a whole, I can’t really come up with any truly great stories. You look at the FF, there’s the Galactus Trilogy and a bunch of great Lee/Kirby stories. 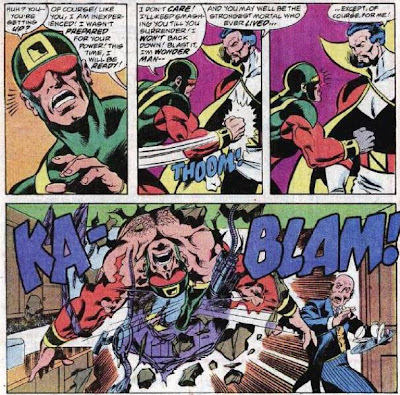 The Avengers have the Kree-Skrull War, Under Siege. The X-Men have the Phoenix saga. But the Defenders? The Avengers/Defenders War was entertaining, but at least half of that was due to the presence of the Avengers. Yet I bought the book religiously as a kid, and enjoyed it. Steve Gerber’s run produced some stories that are memorable if for nothing else than their sheer weirdness. But classic Defenders stories? Outside of the aforementioned Avengers/Defenders War, I’m not sure there are any. Doug: Just having read the Guardians of the Galaxy hardcover “Earth Shall Overcome”, which reprints (among other things) the arc that ran through Defenders 26-29, I can speak to those issues as a fun read. I bought those same issues off the spinner racks when I was a kid, and that’s about the closest thing to a “classic” story as far as I’m concerned. 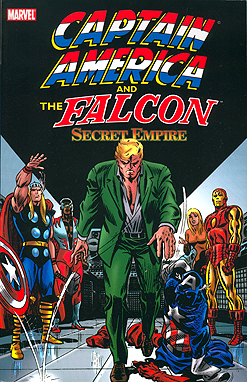 The book was always such a mish-mash of characters; it sometimes seemed like a “Marvel Seven-In-One” book. However, it was generally fun, and I liked getting my dosage of Dr. Strange and the Hulk, since I never followed them in their solo adventures. But time does tarnish those fond memories, doesn’t it? 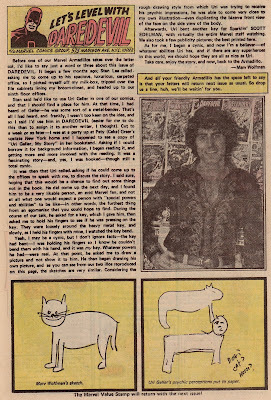 Weird Wednesdays: Uri Geller, super-hero! Mentalists, psychics, mind readers - whatever you call them, they've been around for a very long time. But in the 70s one particular psychic took the world by storm. He was a young Israeli named Uri Geller, and his most famous feat was bending spoons, keys, any sort of small metal object, apparently through the use of his mind alone. Geller originally claimed that he gained his power through a childhood contact with extraterrestrials; in later years, as charges of fraud mounted, Geller has back-pedaled on many of his claims, now billing himself not as a psychic but a "mystifier". Critic James Randi (aka The Amazing Randi) has been an implacable foe of Geller's for years now, claiming that all of his supposed psychic feats are simple magician's tricks. Whatever the truth of the matter, he was popular enough in the 70s to actually co-star in a Marvel Comic! 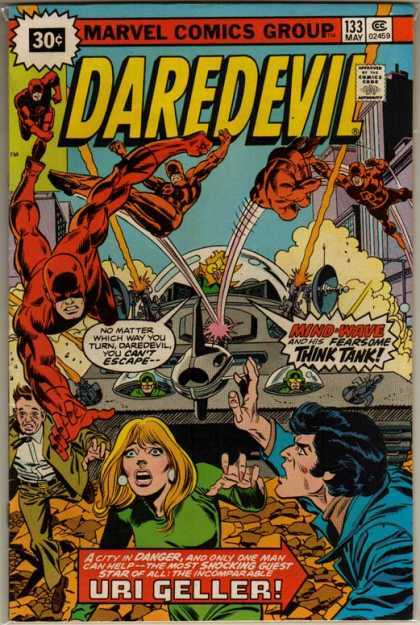 In 1976, Geller was featured in Daredevil #133. Geller and the Man Without Fear combat the extremely lame Mind-Wave and his Think Tank - yes, a tank controlled by telepathy. It's as bad as it sounds. 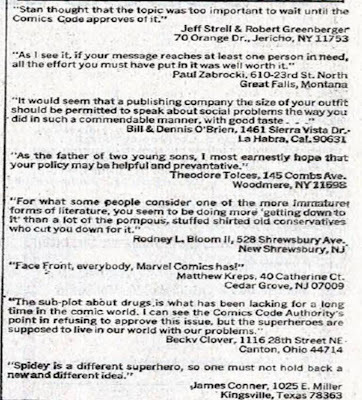 Writer/editor Marv Wolfman explains on the letters page of the issue that the team-up came about at the request of Stan Lee. Wolfman met Geller, who not only bent one of his keys, but 'psychically' duplicated a hidden drawing (see letters page). This was enough to convince Wolfman that he was the real deal, and so Uri became a super-hero. The story includes Geller's origin, which doesn't specify extraterrestrials here but does mention a light in the sky (if it was good enough for St. Paul, I guess it was good enough for Uri). To my knowledge, this was Geller's one and only comic appearance, and alas, there are no Uri Geller Slurpee cups. Doug: Fashion police here again. This week our ol' pal Simon Williams is the victim, er -- honoree. We sometimes wonder if those ruby glasses don't affect Wondy's vision. 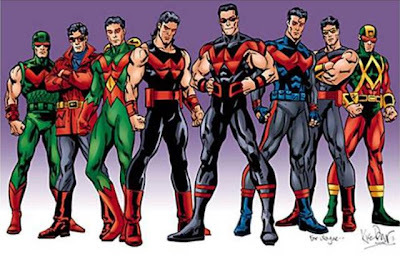 Karen: I don't even know where to begin with Wonder Man. I don't think the guy has ever had a really good outfit. His original Christmas tree costume looks absolutely brilliant in comparison with some of the stuff that came later. The safari jacket never made any sense. The Beast's (aka George Perez') costume for Wondy was a garish thing. But Wonder Mullet has to be the worst. It didn't look good on Superman and it sure doesn't look good on this imitation Superman. Doug: I am at a loss as well. I suppose if nailed down, I'd choose the outfit in the very front of the group photo above. It's pretty standard superhero fare. I have to agree with my partner that the safari jacket-look, despite the numerous color scheme fiascos, is my least favorite. But, for whatever reason I did like the costume designed by the Beast (image to the right) about the best. Of course, one big blast to the chest later and that suit was a thing of the past -- it's at that point that the jacket entered the Wonder-mythos, I believe. Doug: There are a few characters who have worn many different costumes over their careers -- the Wasp and Catwoman come immediately to mind. But at least those girls were bound to have a sense of fashion sooner or later! Ol' Simon just struggled; and all of the time!! 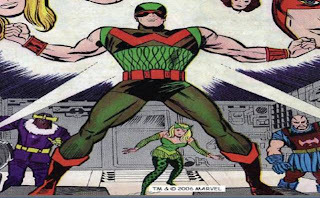 Karen: Verdict: Wonder Man is the Mount St. Helens of costumed heroes! Fashion disaster! Doug: Ditto. Even Cosmic Boy, in all his pink glory, had a leg up on Wondy's closet. Lee wrote the most famous story of this period. 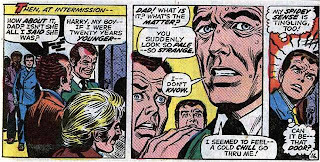 In three issues of The Amazing Spider-Man (#'s 96-98, dated May-July 1971), Peter Parker's friend and roommate (and the boyfriend of the ironically named Mary Jane Watson) becomes addicted to tranquilizers. Pillhead Harry Osborn also happens to be the son of arch-villain the Green Goblin, which allows for a few fight scenes amid the domestic drama. The dialogue is sometimes less than convincing, such as Harry's testament to his bad habit in issue #97: "Here it is. This is all I'll need to make me feel on top of the world again." 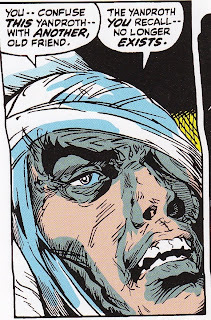 Gil Kane drew the issue with great aplomb and a seriousness that gave the blunt plot a measure of dignity. ...Yet, except for a final conflict where Spider-Man makes the Green Goblin quit fighting by forcing him to confront his hospitalized son, the story lacks the light-hearted self-awareness that originally sold Marvel to its fans. The real world worked much better as a way to undercut fantasy than fantasy worked as a way to shed light on real-world events. Still, all three special Spider-Man issues were a publicity-driven hit, and in the very next issue, Spider-Man was breaking up a prison riot. Marvel published all three drug-story issues without the Comics Code Authority's stamp of approval, a calculated risk at the time. The CCA was clear that no depictions of drug use would appear in the comic books that received its approval. But Lee, who had been inspired to tackle the issue by a request from officials at the Department of Health, Education, and Welfare, felt that he and Marvel could win against the code. The story was generally praised by fans and received a rash of positive press coverage. Lee and Marvel won their game of chicken with the CCA. 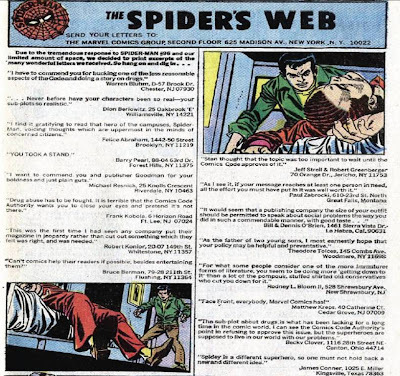 A revised version of the Code, which somewhat better reflected the more media-savvy times of the early 1970's, was issued on the heels of the Spider-Man drug storyline. In September 1972, Lee received a letter from the President's Special Action Office for Drug Abuse Prevention asking for help in coordinating other comic-book efforts in the growing antidrug campaign. NOTE: The "drug story" that ran in Green Lantern #85, showing a young Roy Harper, aka Speedy (how's that for ironic naming? ), using heroin right on the magazine's cover, was cover-dated August/September 1971. Doug: It's interesting that after the liberalization of social mores in the late 1960's that the Code was forced to re-examine itself. It's even more interesting when we see how the alleged instigator of this censorship had changed his tune. Dr. Frederic Wertham, who most believed ushered in censorship in the comic book industry with the publication of his book Seduction of the Innocent in 1954, told the Miami Herald's Jay Maeder in a 1974 interview: " ...in psychological life, it isn't so that you can say one factor has a clear causal effect on anything. I never said, and I don't think so, that a child reads a comic book and then goes out and beats up his sister or commits a holdup." (quoted from Ron Goulart's Over 50 Years of American Comic Books). Perhaps Wertham's point of view at this time was influenced by the glut of positive press Marvel and DC were receiving in the mainstream American press? Karen: Or possibly his reaction in the 50s was a product of the times, with all the witch-hunts going on. By 1974, it seems likely he would have mellowed. Karen: After reading many interviews with Stan, I honestly believe that his primary motivation was to point out the perils of drug abuse. He has always come across as wanting his comics to send the right message to kids (back when kids actually read comics). Stan was not shy about tackling racial issues either. 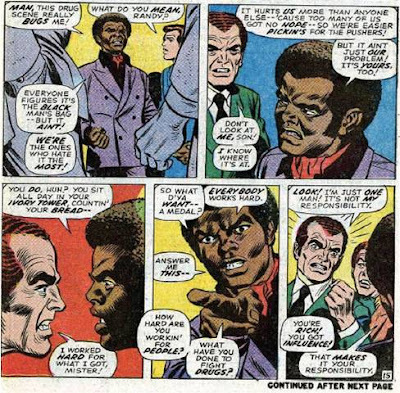 I'm thinking specifically about the Avengers issues with the Sons of the Serpent, although I think his effort to include African American characters in very positive ways in the books was also a way to subtly combat racism. Karen: I would say it was more a happy accident that the issues got so much good press. I'm sure Stan was pleased by that, but I don't think his intentions were just about drumming up sales. Doug: I think one thing to remember is that during this time, Stan really did see a lot of the fan mail that came in. And it's well known that it was he who wrote most of the responses in Marvel's various letters columns. So if Stan comments on the pulse of Marveldom Assembled, it was probably not just more hot air from The Man but instead a measure of what their readership really felt about certain stories or issues of the day. Karen: I recall reading in other interviews with him that they never wanted to alienate any reader, but there were certain things that he felt it was important to take a stance on. Doug: In closing, let's take a look at how that readership responded to Marvel's decision to go to press without the Comics Code Authority stamp of approval. It is eye-opening to say the least. Now, we of course don't know the ratio of positive fan mail to negative, but I think we can assume that for the most part, in his huckster-ish way, Stan was honest with his readers. 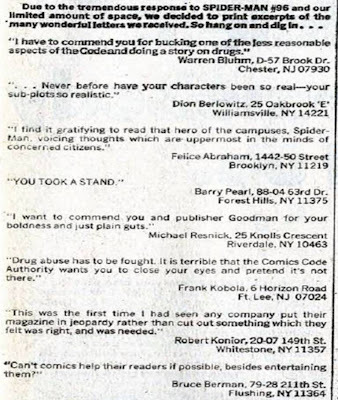 I'm going to give him the benefit of the doubt that the letters that were printed on the letters page of Amazing Spider-Man #100 were indicative of the papers that crossed Stan's desk in the days of the fall-out from the publication of Amazing Spider-Man #96.